It is meant to crush mineral materials, organic materials, and materials of industrial origin, with compressive strength up to 250 MPa, as well as to crush sticky and wet materials. 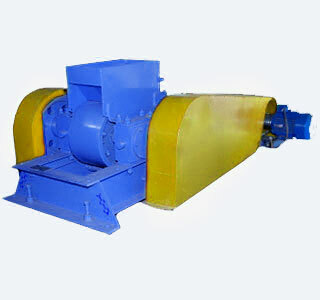 A Roller crusher is used for fine crushing, of nonmetallic construction materials of low strength - wet, viscous, or pasty. The process implies squashing of material. Double-roller crushers have proven to be the best solution to grind materials with sticky properties or containing sticky inclusions. Samara Plant Strommashina offers a wide range of crushers, crushing and grinding units, and other industrial equipment. We can help you take a fresh look at production processes of your Company. Based on the equipment produced, we can select a technology and make basic and non-standard equipment for complete process lines to grind mineral and synthetic materials. Buying equipment from Samara Plant Strommashina, you obtain guaranties of high quality, reliability, simplicity of operation, maintainability, competitive price, uninterrupted supply with spare parts and service. All our equipment is certified. The original designs are patented.